This bed comes in one size only --21in. x 21in. x 9.5in. 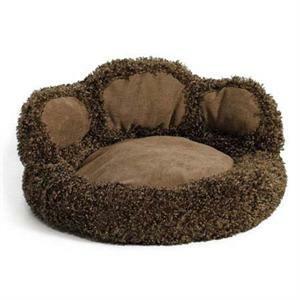 It is round with a bolster to resemble the toes of a paw. The toes are of Faux Suede. The bottom has a removable Poly-fiber Pillow. The rest of the material is a Chocolate-Colored Synthetic Fur. The Polyester material is durable and machine washable.